Dixieland band hire is perfect for your event! It is ideal for a variety of functions including weddings, corporate events and themed parties. Silk Street Jazz are Silk Street’s signature Dixieland act. They will recreate the classic New Orleans Dixie sound, ensuring a foot-tapping and fun-filled occasion. 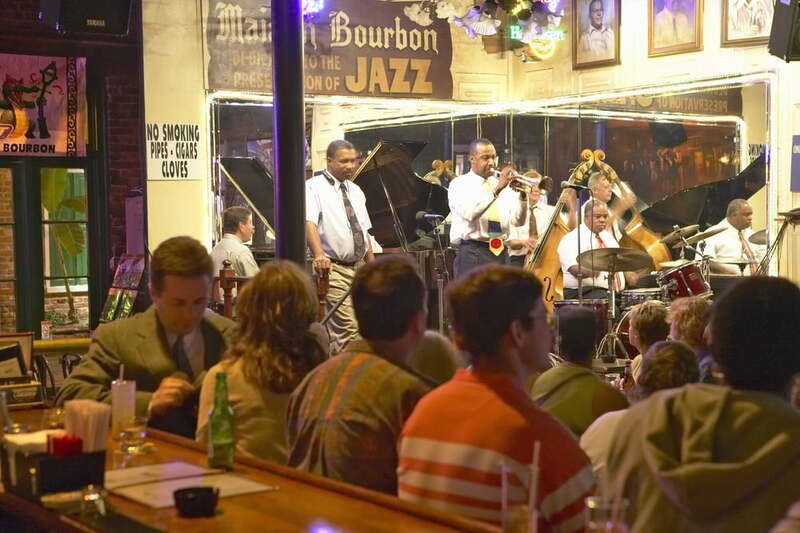 For many people, Dixieland is synonymous with one thing – or one place – New Orleans. It was in The Big Easy that the sound of Dixieland emerged at the beginning of the 20th century. Since then, Dixieland has taken many twists or turns. Popularised by the recordings in 1917 of the Original Dixieland Jazz Band, the sound is also known by two other names: hot jazz and traditional jazz. Both are very apt terms: ‘hot’ because of how great it sounds; and ‘traditional’ in that Dixieland is simply the sound of jazz. The jazz purists out there will be well aware of the Dixieland journey through the years. It has evolved in many ways, from Chicago Style to Dutch ‘Old Style’ Jazz, and the West Coast Revival of the late 1930s. But you don’t need to be a jazz connoisseur to understand the enduring appeal of Dixieland. For example, just check out the International Dixieland Festival – held every year in Dresden. Esteemed US jazz writer and historian, Scott Yanow, has described Dixieland jazz as “the happiest of all music.” And it’s this that is the main reason why a Dixieland band hire is such a smart move for a range of events. From weddings to corporate events to product launches, music that puts a smile on faces and gets feet tapping is always going to be a winner. And with a Dixie band that is pretty much guaranteed. Not only that, it all comes with that effortless ‘Big Easy’ New Orleans cool as well. Whatever the occasion, Silk Street Jazz are the Dixie band that will rise to it. New Orleans jazz really brings a celebratory mood to a wedding day. Silk Street Jazz offer flexible line-up choices and will tailor performances to meet your needs exactly. They can perform before, during and after the wedding service. Silk Street Jazz will brighten up the drinks reception, spice up the photographs, entertain at the wedding breakfast, and keep guests on the dancefloor all night at the evening reception. Right at the other end of the event spectrum, Silk Street Jazz are also the ideal act for funerals. Embracing the traditions of a New Orleans funeral is a fitting way to send off a loved one, as this blog explains. So, whatever the event is you have planned, remember when it comes to Dixieland band hire there can be no better choice than Silk Street Jazz. Call us for a chat and get in touch to discuss your requirements.